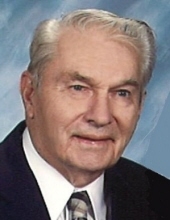 Joy Crafton “J.C.” Hoffman, 96,of Terre Haute passed away Sunday, March 24th, 2019. J.C. was born April 15, 1922, to Leonard and Dixie (Crafton) Hoffman. In 1945 he married Dorothy (Carter) Hoffman, who survives. Also, surviving are their three daughters, Rebecca (Frank) Davis, Rita Baker, and Sharon (Steve) Strycker. There are six grandchildren, Heather (Patrick) Sheehan, Myra (Jim) Priser, Jamie Baker, Stacy (Dustin) Schutte, Micaela Strycker, and Jonathan Strycker, along with six great-grandchildren, Rebecca, Kyle and Trevor Sheehan and Justin, Jake and Cole Priser. Also surviving are J.C.’s brother and sister-in-law, Dr. Max and Helen Hoffman and much loved nieces and nephews. He was preceded in death by a son-in-law, Frank Davis, and brother and sister-in-law, Wilbur and Gladys Hoffman. J.C. was raised in Cory, IN and served in the Army Air Corps in World War II. Upon his return from duty, he attended Purdue University’s Agriculture Short Course and was a proud member of the Purdue Ag Alumni Association. He and Dorothy farmed in rural Clay County. They were members of Union United Methodist Church. Upon retirement, they made their home in Terre Haute. They maintained strong, lasting church and community friendships. Funeral services will be conducted at 11:30 AM (EST), Friday, March 29, 2019 at Callahan & Hughes Funeral Home, 605 South 25th Street, with Pastor Marc Kirchoff officiating. Visitation is scheduled prior to services on Friday from 10:00-11:30 AM. Burial will be in Oak Hill Cemetery in Riley, IN. To send flowers or a remembrance gift to the family of Joy Crafton "J.C." Hoffman, please visit our Tribute Store. "Email Address" would like to share the life celebration of Joy Crafton "J.C." Hoffman. Click on the "link" to go to share a favorite memory or leave a condolence message for the family.